Thanks to this instant drink chiller, hot beverages chill out to icy cold in under two minutes—without diluted flavor. The pitcher and insert combo is made with BPA-free, high-density plastic tubes filled with filtered water. Keep the insert in the freezer for quick cool-downs of coffee, tea, beer, wine, and even fizzy drinks. Fluid capacity: 16 fl. oz. Dimensions: 5.5" x 5.5" x 6.25"
My wife and daughters LOVE this!! The girls are away at College and Grad School so I had to get extras for them to take to their apartments. 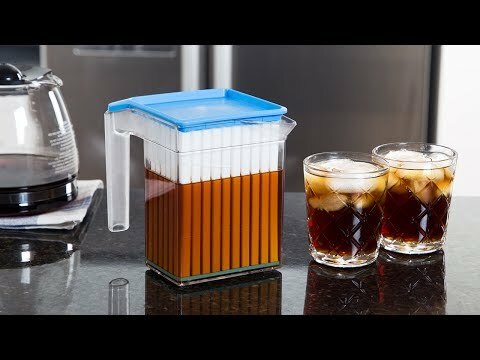 This makes a perfect cup of ice cold fresh brewed iced tea every day. I love it. Coldwave is an instant drink chiller—and we mean instant. 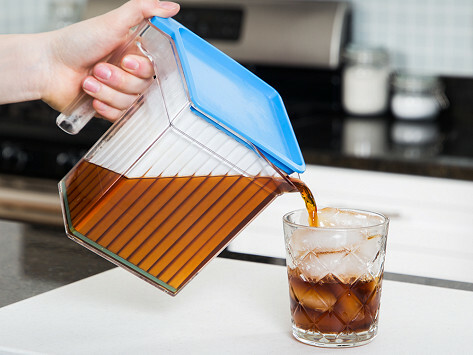 This clever pitcher is Made in the USA and will transform freshly brewed (and piping hot) coffee to icy cold in under two minutes. And it does it without diluting the flavor. Founder David Dussault was looking for a way to avoid the watered-down flavor of his iced coffee. So he created this pitcher and insert system to cool drinks down without affecting taste. Keep the insert in the freezer, then place it in the pitcher full of beer, wine, or even carbonated drinks for an instant cool down. The chambers in the insert are made from high-density plastic tubes filled with (chemical-free) filtered water. It works similarly to an ice pack—but this plastic is BPA-free and dishwasher safe. Now that hot cup of coffee or tea can be iced—and just as tasty—in no time.